It is a kind of low-light level night vision telescope，which means it can be used for night vision with some light but can not be used for totally pitch-black night vision. 【SUPER CLEAR VISION 】 The outdoor monocular with 10x42 magnification with 60mm prism lens design provide high power magnification, A perfect tool for birds watching, concert watching, golfing, hunting, climbing, fishing, attending sports events or even just view enjoying. 【WIDER & FURTHER FIELD OF VIEW】FMC multi-layer enhanced green film increases light transmission for brighter and higher-contrast images, the farthest visual distance can up to 9500m, it is 20 times further than other ordinary cameras. More enjoyment with wider and further vision. 【EASY TO FOCUS】Mulit-coated optics upgraded version of the green AR, dual for focus capability. This monocular telescope can be adjust to match the distance of your eyes, single hand operation and suitable for both adults and kids. 【WATERPROOF & DUSTPROOF】User friendly design, built in lens dust cover can prevent lens from dust and make sure you see everything in a clear detail, waterproof rubber coating helps to prevent water getting into monocular telescope, sefely use even in rainy day . 【DURABLE TO USE】Rubber coating protects the body from impact and wear, lightweight and compact, easier and more convenient for outdoor using. If you have any questions about this product by Meter.llc, contact us by completing and submitting the form below. If you are looking for a specif part number, please include it with your message. Monocular Telescope, Waterproof Fogproof 40x60 High Powered Monocular Scope with Phone Adapter and Tripod, Optics FMC BAK4 Prisms for Bird Watching, Travel, Concert, Sports, etc. 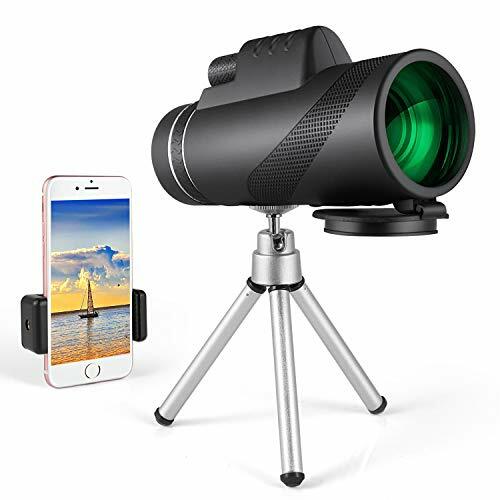 Monocular Telescope By MonoSee | Telescope for phone, Binocular Scope - Ideal for Hiking, Night Vision, Site Seeing, Camping, Sports, Wildlife, Waterproof, Free Phone Attachment & 2 Tripods. 12X50.